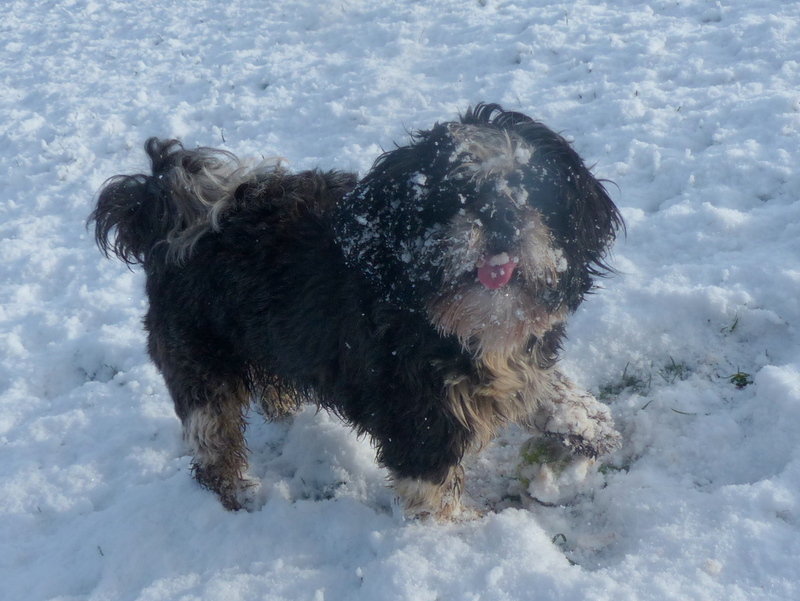 We had a little bit of English snow last night, it nearly hid the grass and by eight o’clock this morning it was drip, drip, dripping, everywhere. It was still enough to put the Sheep into a tizzy and you can guess what we were up to this morning. This stupid animal just kept going deeper and deeper into the bramble as I tried to cut a way to her. I ended up pulling her gently out by a bramble as I just couldn’t get near to her. 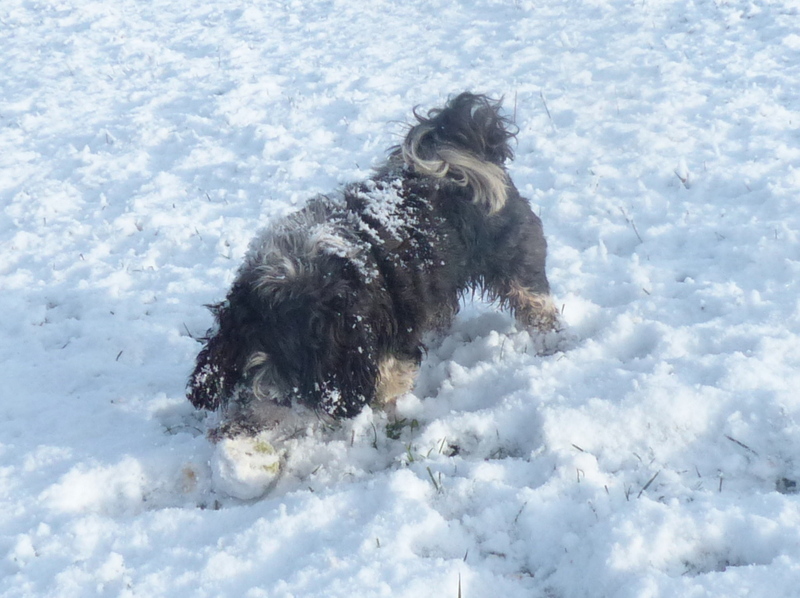 It looks cruel but then I am cruel and I would not shy from starting a snowball fight with a little defenceless puppy either. 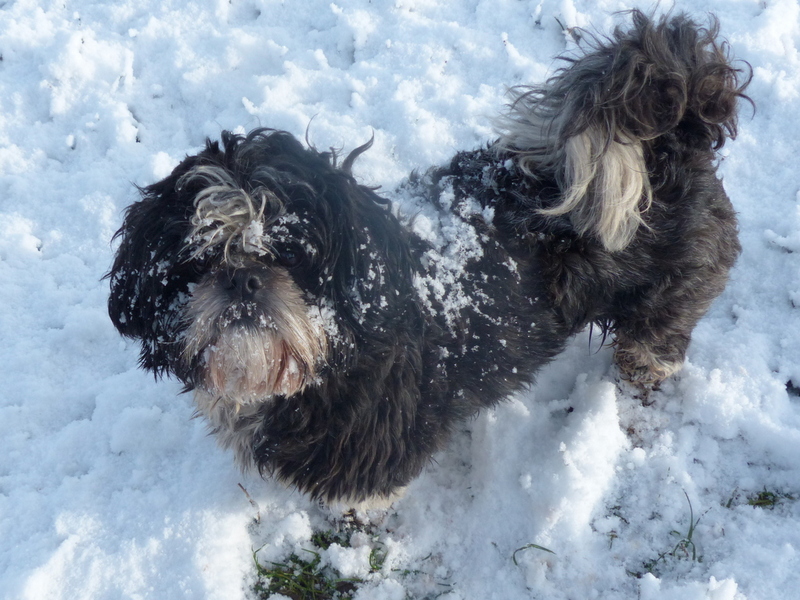 Unfortunately Fizz didn’t understand the first rule of fight club: You can’t throw snowballs back, you might hit the camera. Most of the pictures that I took today turned out to be ruined due to me having a snowy and wet camera. Then we found another Sheep in distress. This one was so badly tangled it was walking on three legs. That was all that we needed, the Sheep have to be brought in. So they have been, they are all cleaned up and tucked away in the orchard. They will stay there now until the end of next week because the farmer is going on holiday and I don’t want the Sheep out while he is away. Next week I am in charge. Yes. I am in charge of you too. I put the trail camera out last night. I had to alter my plans slightly, I don’t want to draw attention to the animals on public land and I didn’t know how much snow we were going to get. No matter how well I conceal my bait, if it snows the animals will leave an obviously turned over area and tracks all around. 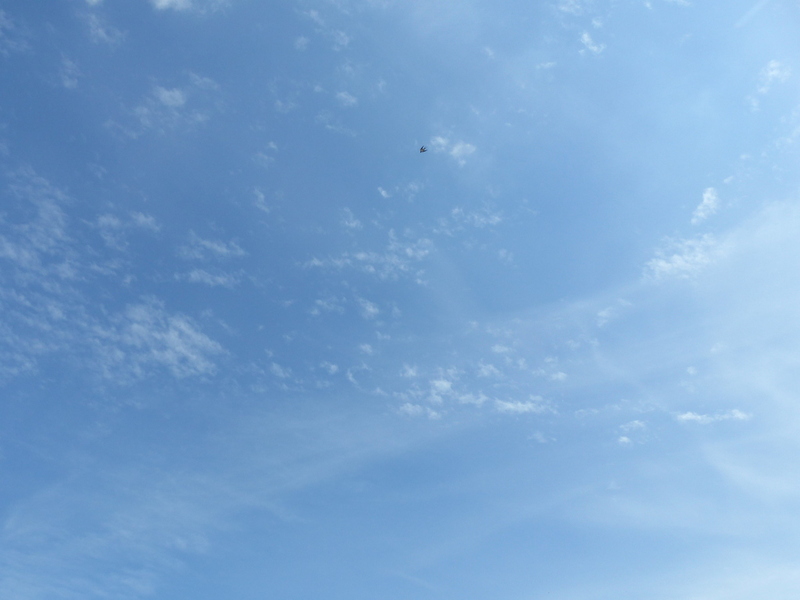 So I decided just to put the camera out on the farm and see if I could catch anything there. This first video is of a Fox who is disturbed by a U.F.O. Foxes and Aliens are predictable fodder for a Gloucestershire farm, on a winter’s night. I didn’t expect this next one. One o’clock in the morning when they should be tucked up in their little woolly blankets, fast asleep. What on earth are these sheep doing? As far as I can tell a group of them are creating a diversion whilst one of them removes the batteries from my camera and changes the SD card. What do they want with batteries and what was on that SD card that they didn’t want me to see? Well that is enough blarney for today. Some friends of mine have been having dreams and sometimes these dreams have been coming true, not always in a good way. 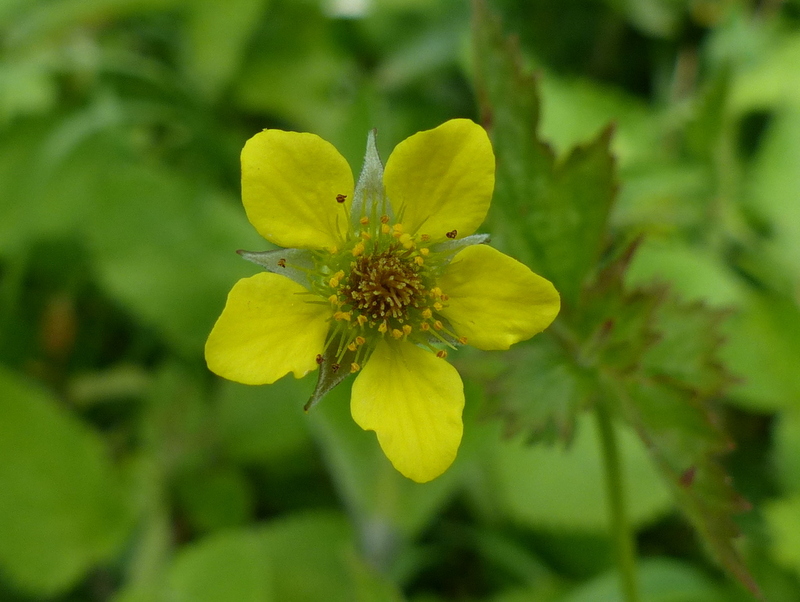 Now this is the honest truth, last night I dreamt that I was writing about Geum urbanum, in my dream I carefully chose the pictures that I would use (One of them I remember was of a silver Ford Transit van) and I chose the words. 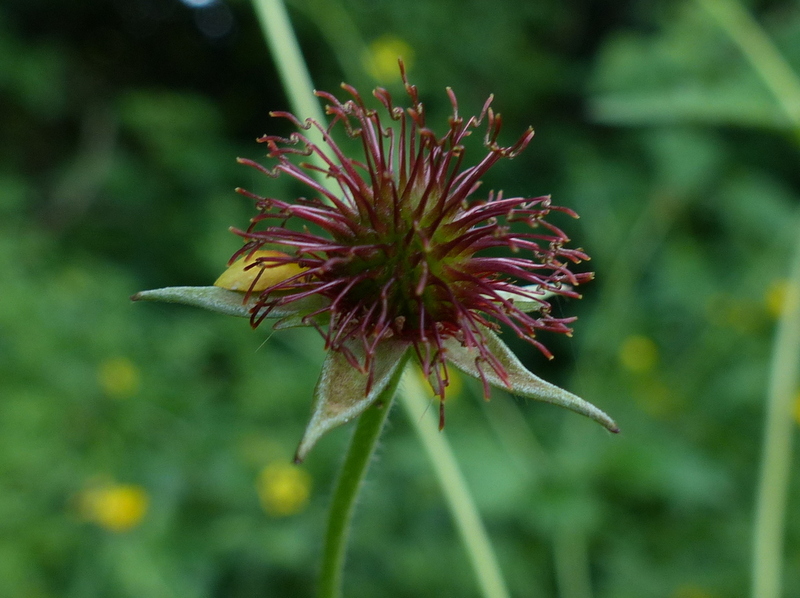 Geum urbanum, Wood Avens is also widely known as Herb Bennet. 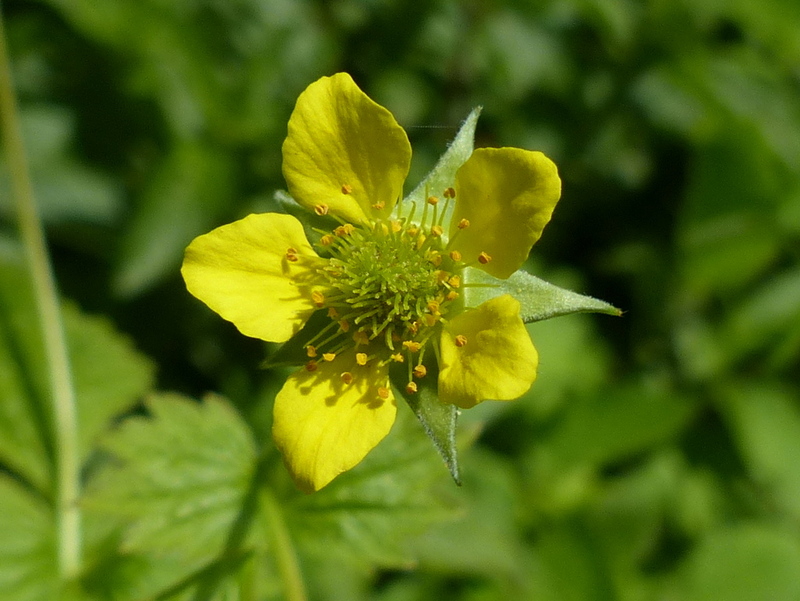 A member of the Rose family the genus Geum is commonly known as Avens, it is very closely related to the Potentilla (Barren Strawberries) and the Fragaria (Strawberries) a relationship reflected in the shape of the flower. The species name urbanum just means urban (of the town or city). 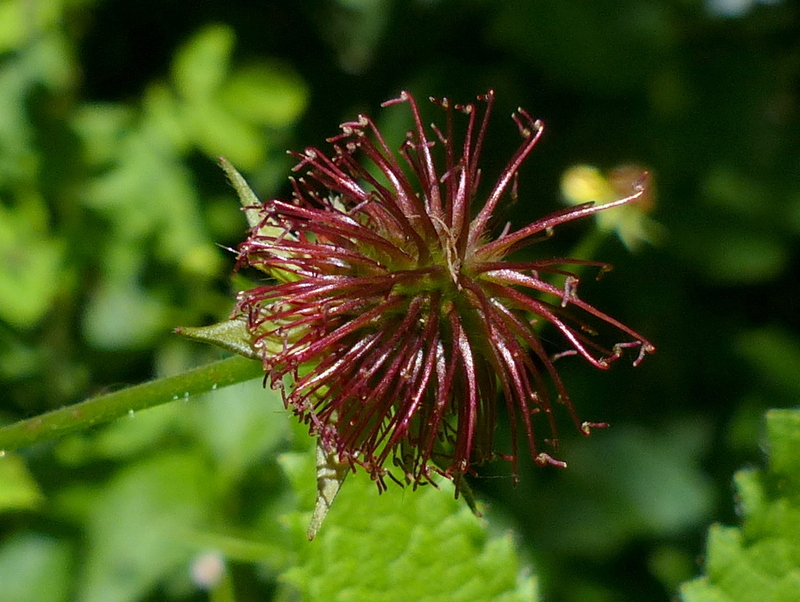 It is a species closely associated with man as it grows well on disturbed ground but also the burrs that carry the seeds tend to stick to men and their livestock and so follow them around. 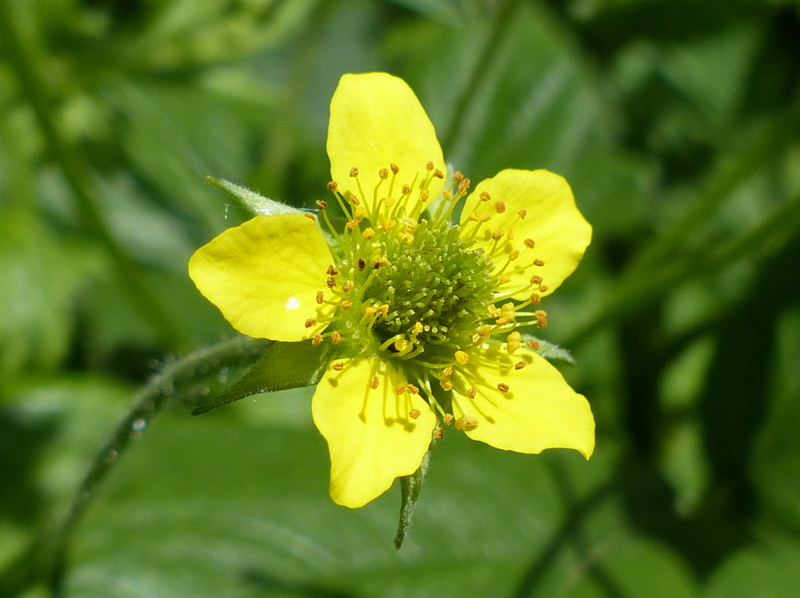 Locally Wood Avens is a plant of woodland edge and hedgerow. 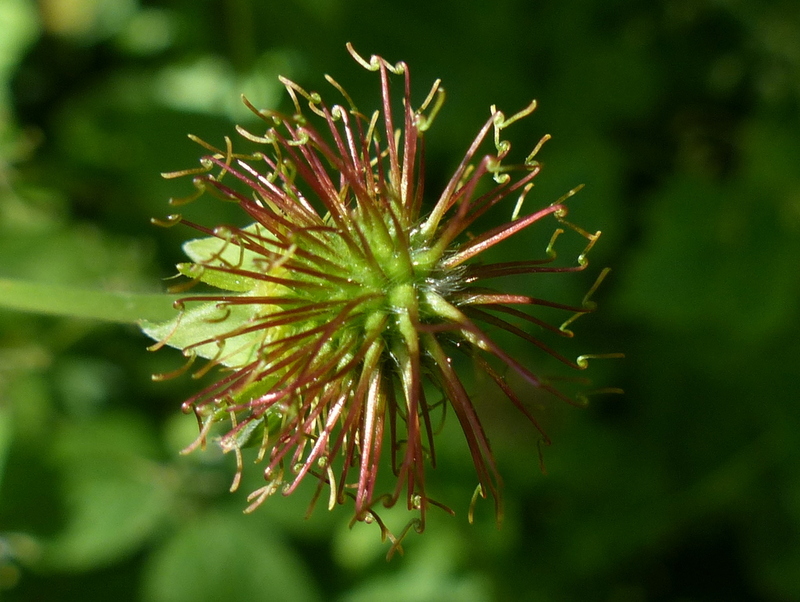 I am going to look at how the small strawberry like flower develops into the hooked burr that is the seed head but first we should have a quick look at the calyx. 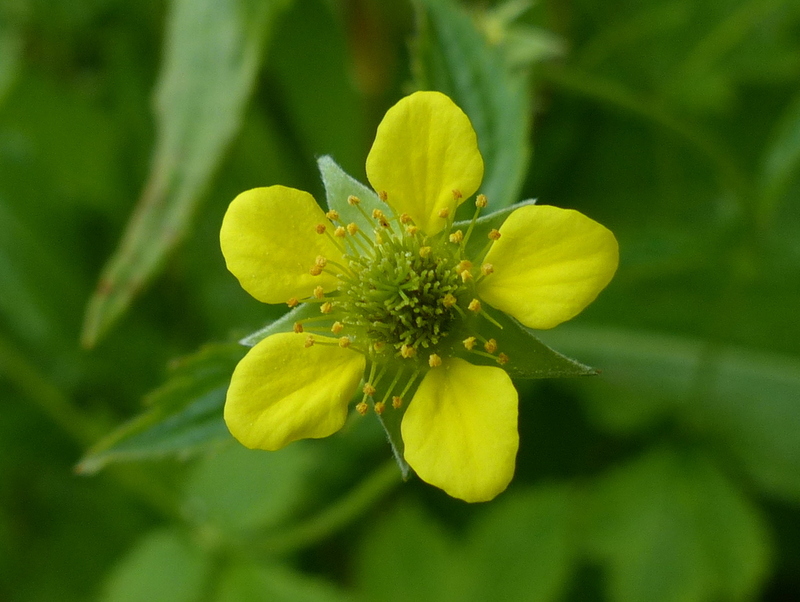 The calyx is made up of five sepals. 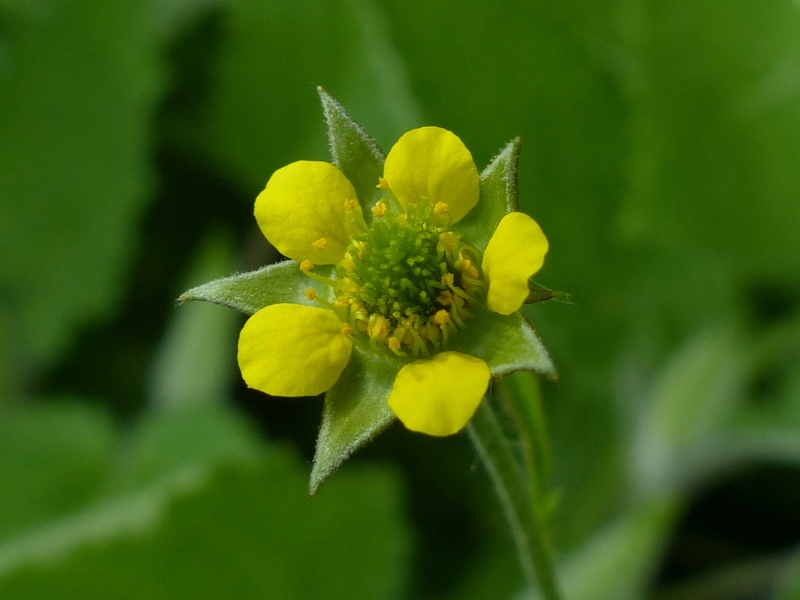 Between each of the large sepals is a small bract called an episepal and they form an additional structure called the epicalyx. 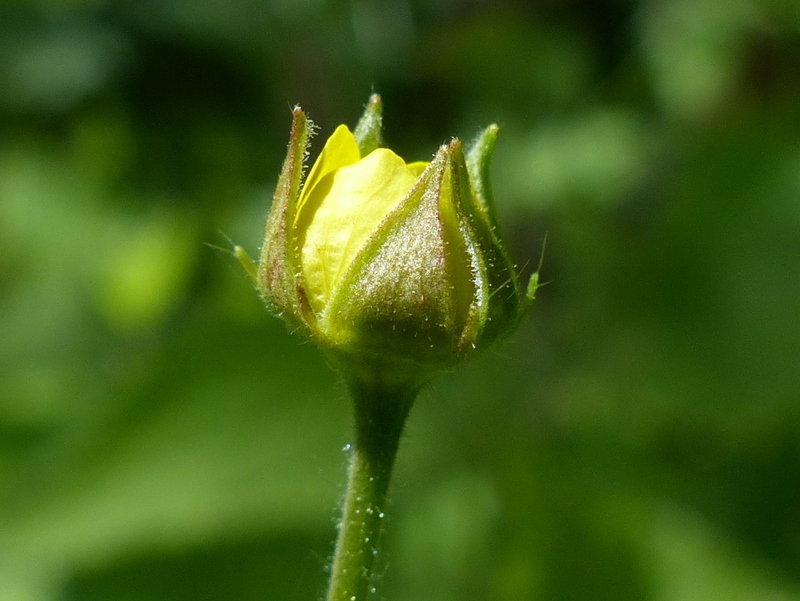 The sepals that form the calyx are there to enclose and protect the flower as it develops. The epicalyx just seems to add extra protection. 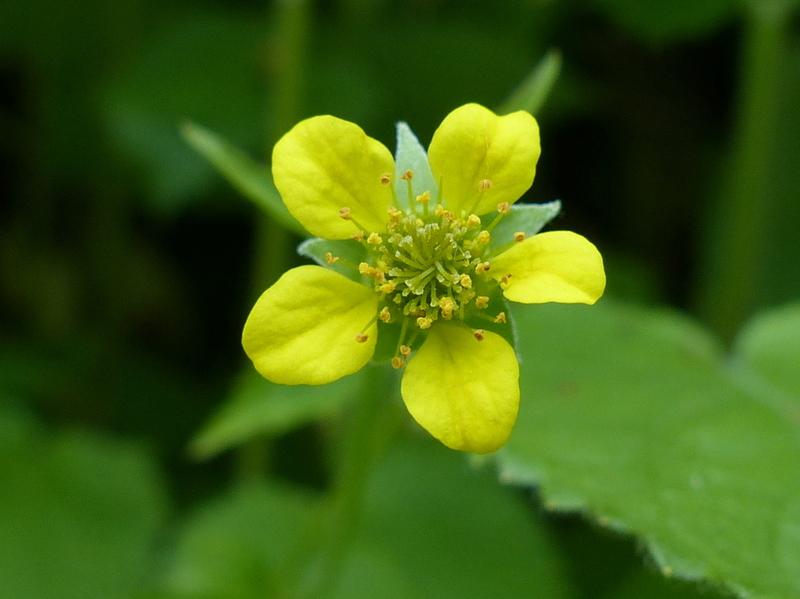 The flower has five yellow petals, they are widely spaced like those of the Barren Strawberry. 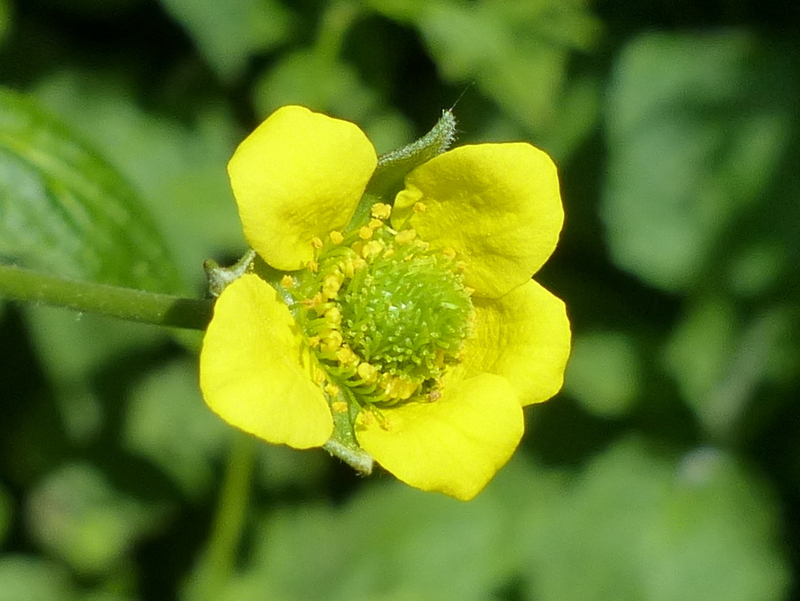 A ring of yellow stamens enclose the green, multiple styles that will become the burr. 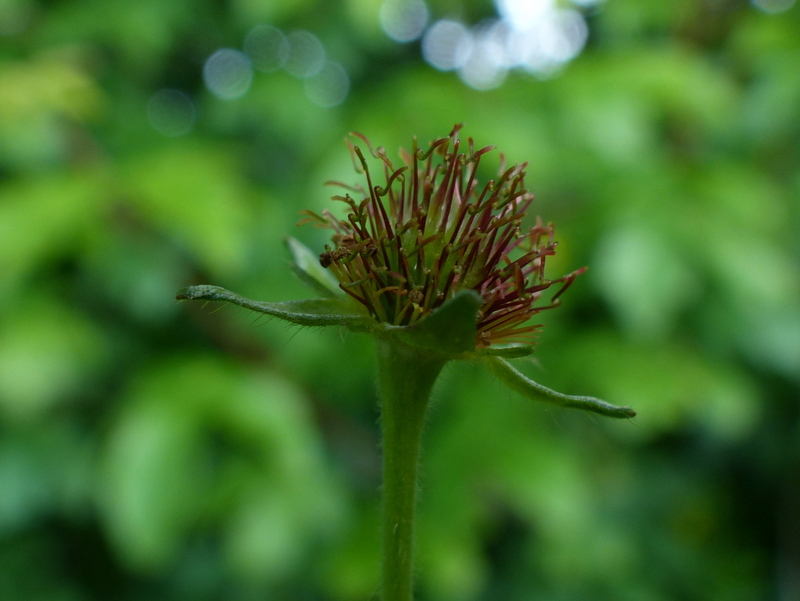 As the flower matures the styles turn from green to brown. The petals drop off, Seeds are developing at the base of the styles and the styles are becoming kinked and hooked at the tips. 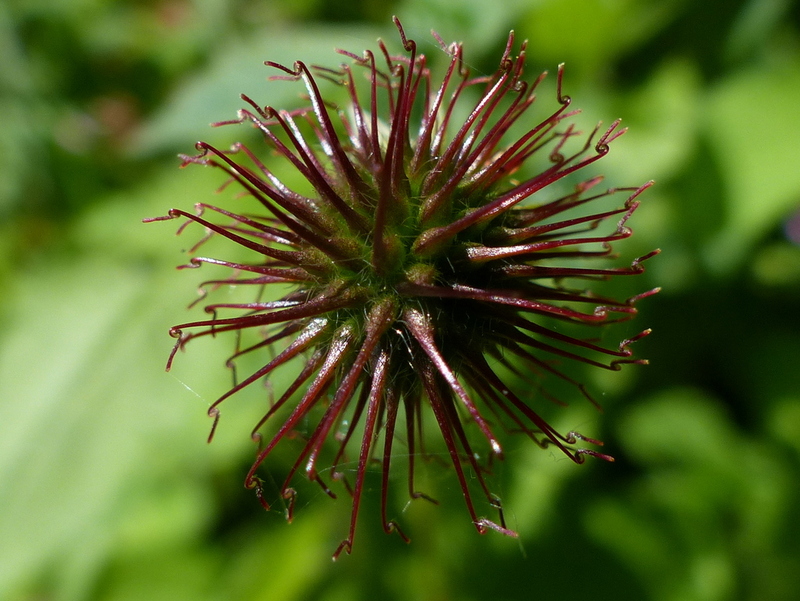 All that remains of the flower is the burr which will attach itself to a passing animal and so disperse. 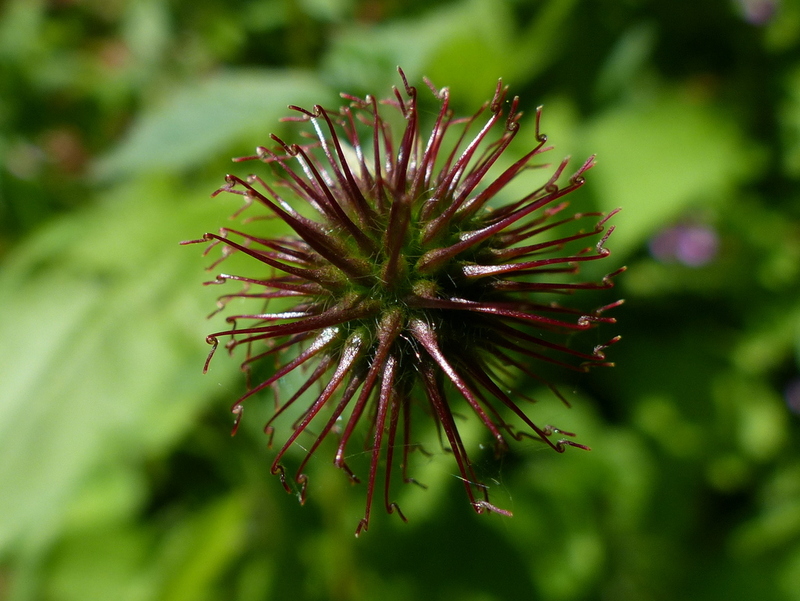 The whole of the plant is slightly hairy. The leaves are quite variable. 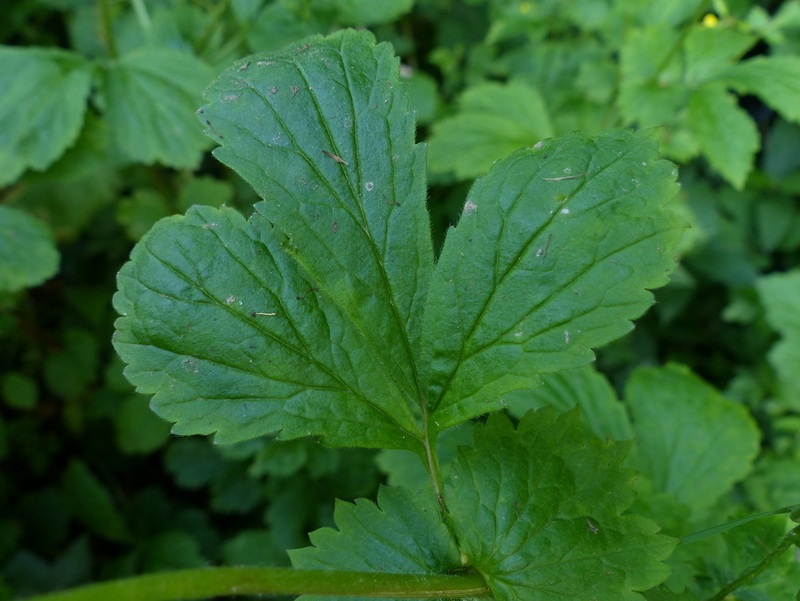 At the base of the plant the leaves are quite rounded with toothed edges. 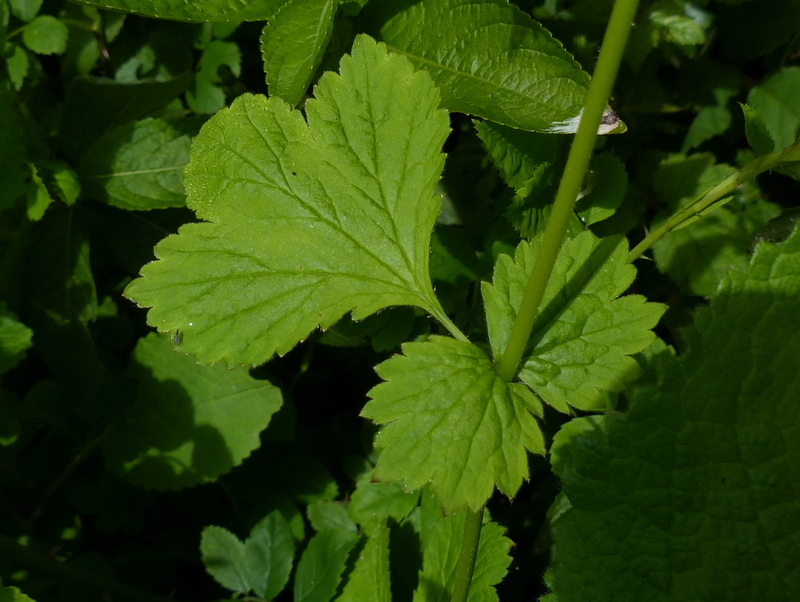 They are trefoil, having a large leaf with two smaller leaves set at right angles at the base of the leaf stem. 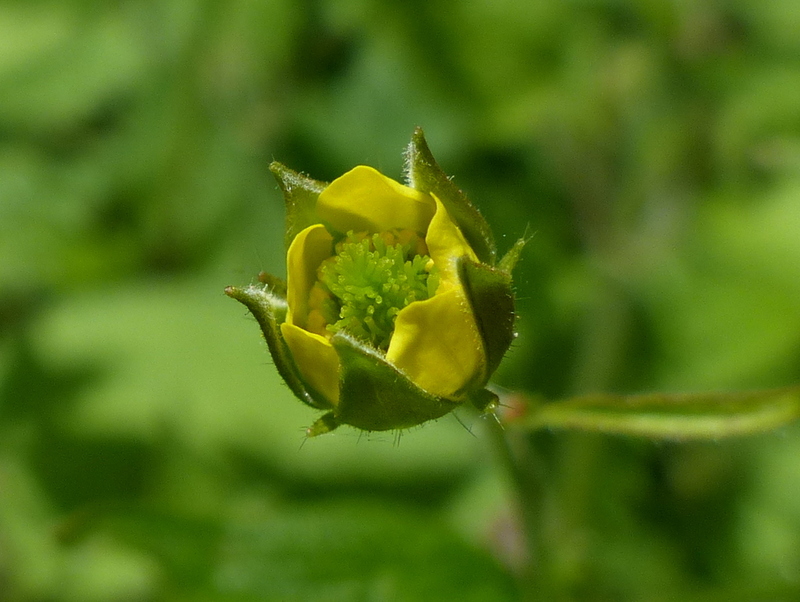 As you move up the plant the trefoil aspect of the main leaf becomes more obvious. 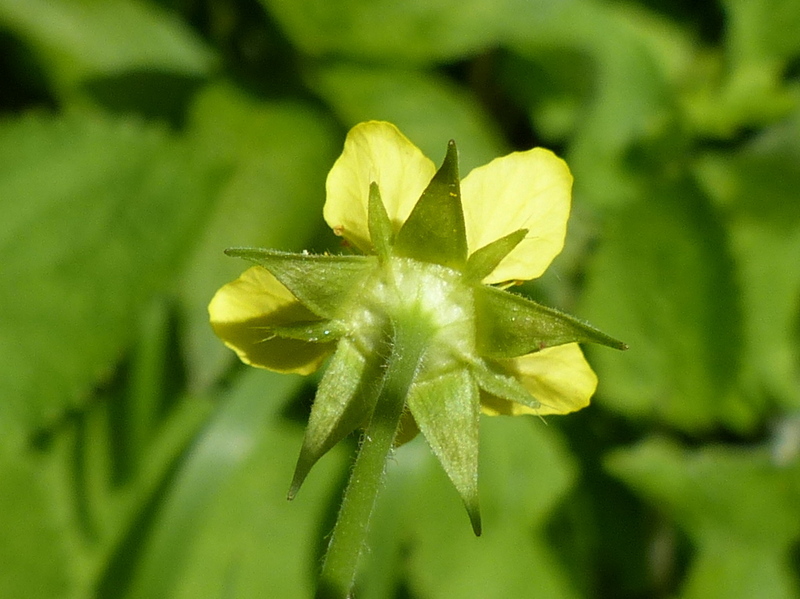 At the top of the plant the trefoil nature of the main leaf seems to be abandoned and we are left with a single, toothed, lance shaped leaf with the two smaller leaves still at the base of the stem. 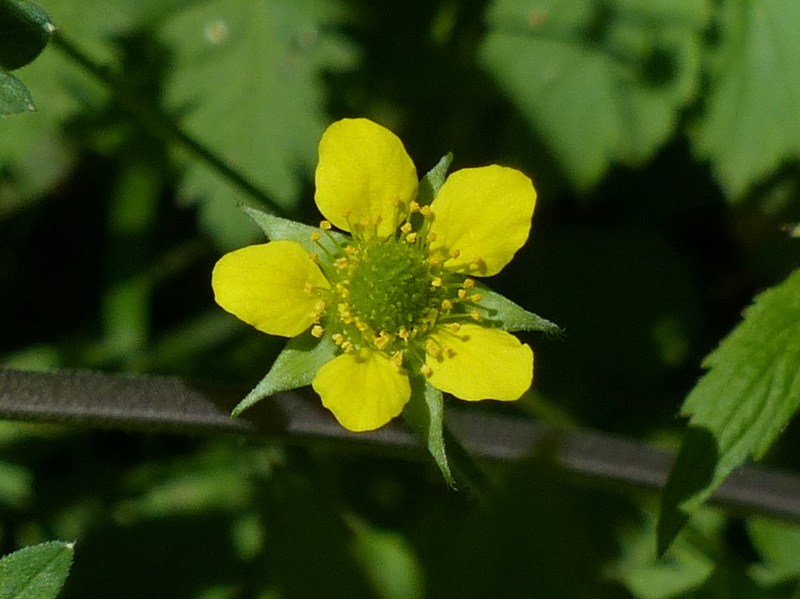 The name Herb Bennet comes from an older name Herba benedicta which simply means Blessed Herb. 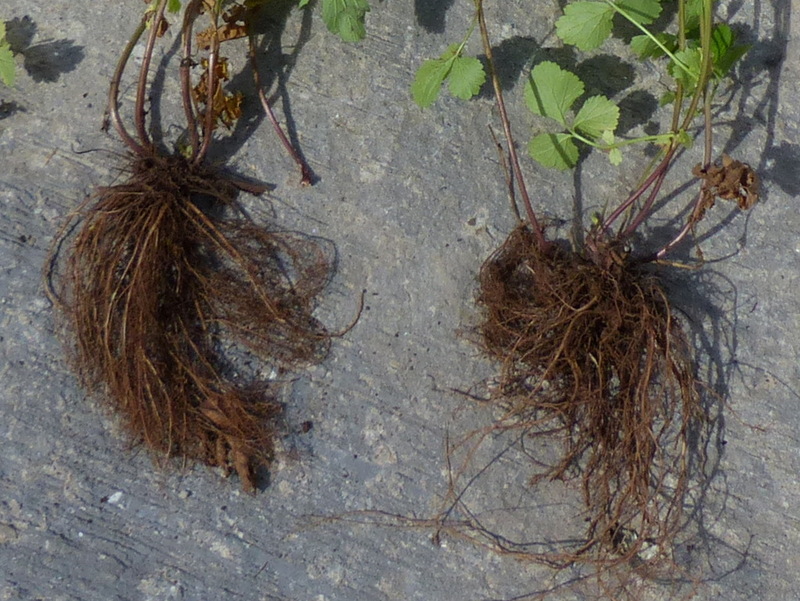 The root of the plant was once worn as an amulet to protect from evil. It was believed that if you kept the root in your house then Satan could not enter and that a man wearing such an amulet was immune to the poison of beasts. 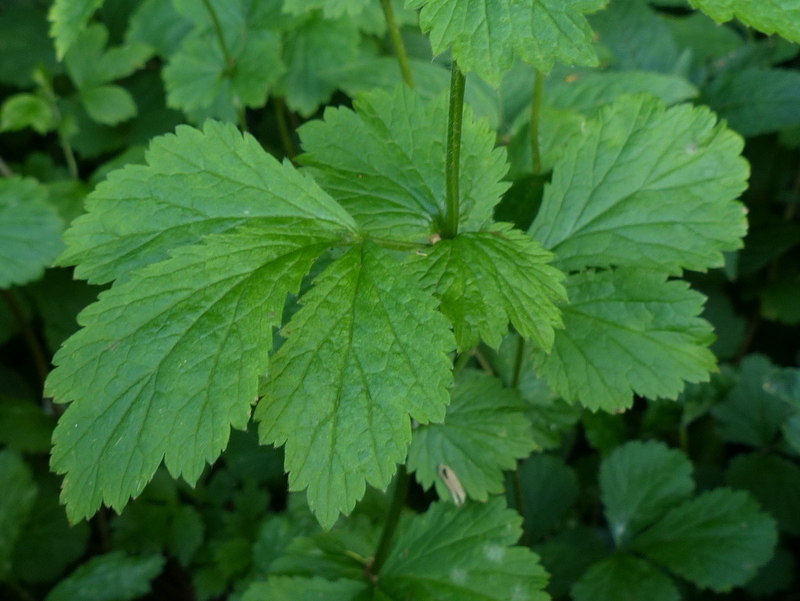 The roots were also widely used in medicine, dried and powdered they were used to prevent stomach ills and to cure poisoning and when boiled with wine a cordial was made to protect against plague. Nights spent dreaming of wildflowers are good nights. 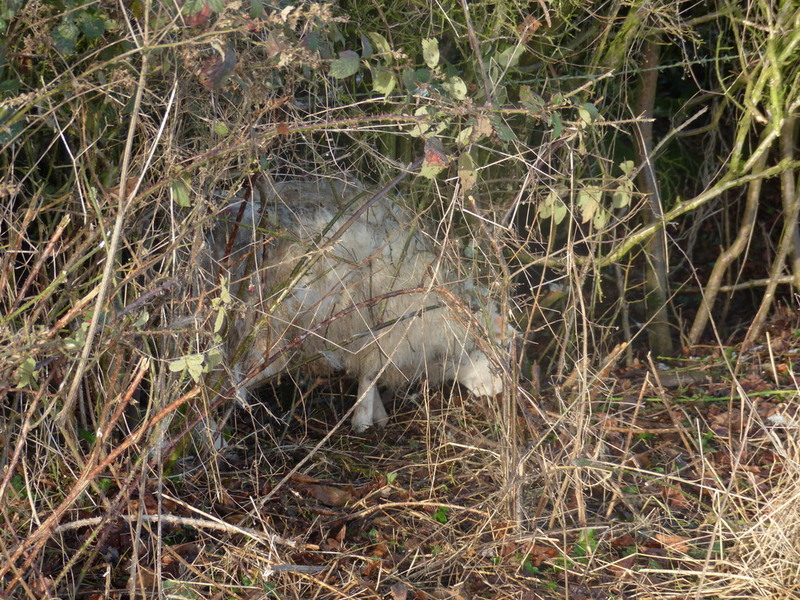 Why do the sheep keep getting caught in the bramble? You would think they would learn by experience that it is something to stay away from. Thank you Anne 🙂 I am at a bit of a loss to understand this. 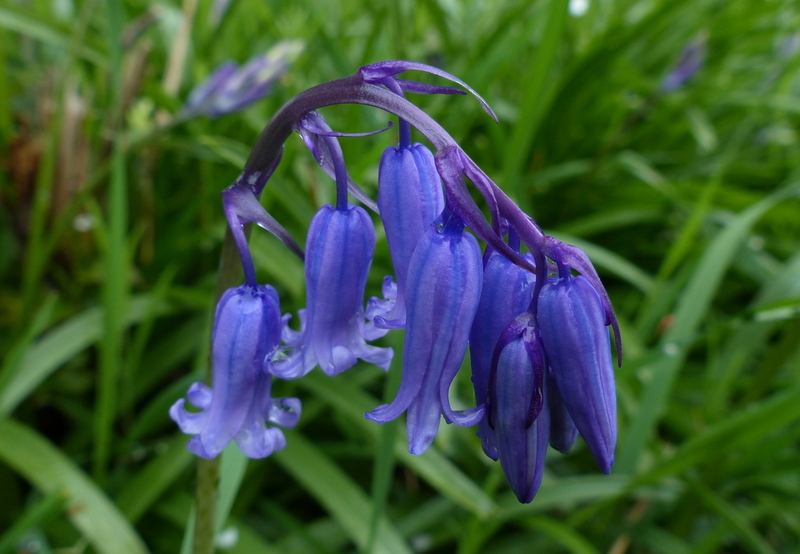 I think that it is related to the time of year and they are going into the hedge for new shoots that are appearing there. Who would have thought that the sheep would mess with your camera! And I guess they aren’t smart enough to learn that they’ll get stuck in the bramble, again, if they go in, again……….but yet they can dismantle parts of a camera, go figure! Thank you Sarasin 🙂 A little further down Joy Window comments on how Sheep remove electric fencing too. Other animals just wander around in the field and be animals but the Sheep are up to something and they need keeping an eye on. 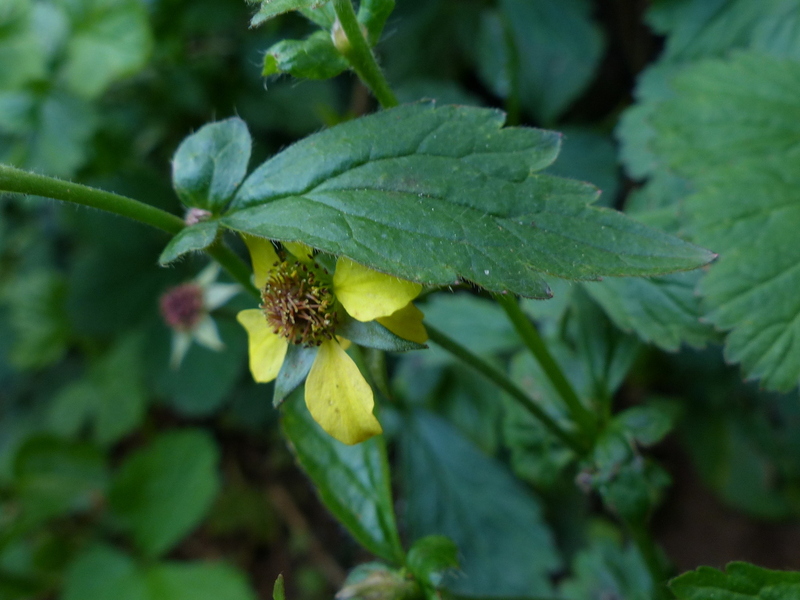 Thank you Becky 🙂 It does look a lot like a yellow strawberry plant but it is very tall (about two – three feet) and then the fruit is quite different. Thank you Gigi 🙂 These Sheep are quite friendly because we feed them. When I walk through the fields they will either follow me , if they think I have food or they will move away but they don’t panic. If one is stuck in the hedge they don’t like me to approach and will try hard to get free and a lot of them are able to free themselves before I can get close enough to cut them loose and that is when they take half the bramble with them. Thank you RR 🙂 The MET office are good like that. 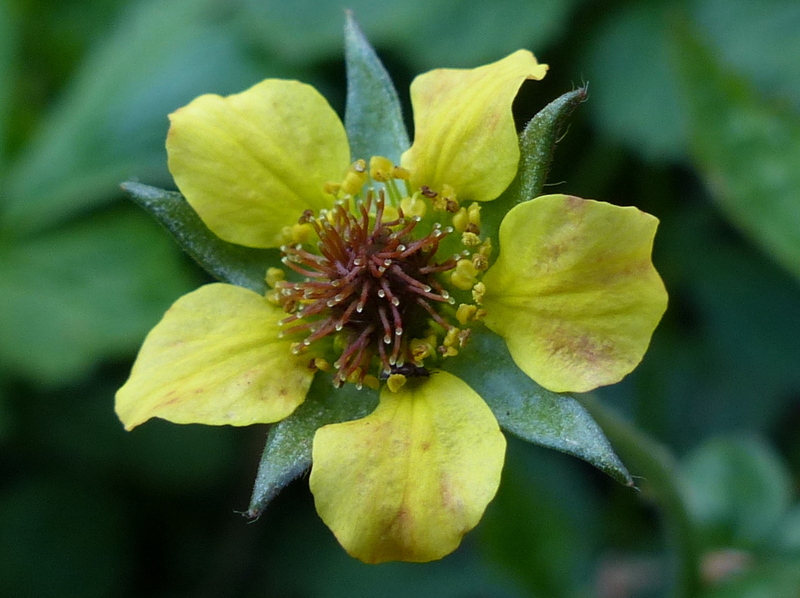 We have a white avens (G. canadense) here and it is ubiquitous, found in the garden, field and woods. I wonder if the herbal properties are the same? It would be good to find a use for it! 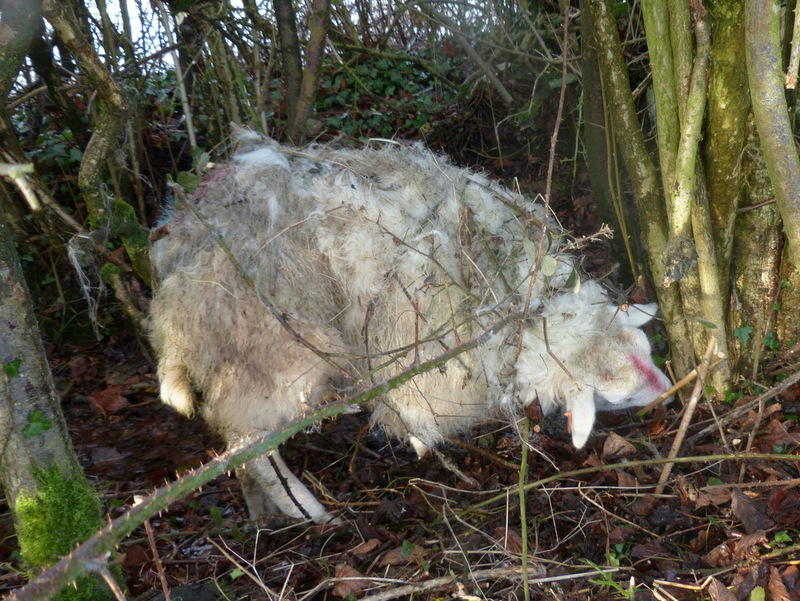 Thank you Eliza 🙂 The sheep that we rescued in this post was stuck in the hedge for quite a while. It was scared of me but not so scared that it would stop eating. 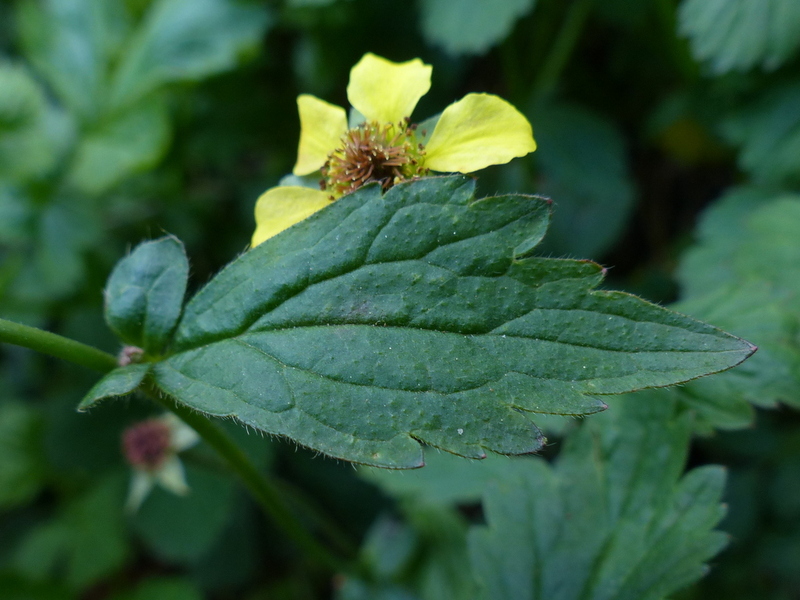 It was eating little green leaves that were appearing at the base of the hedgerow. I haven’t looked at what they might be yet. I think that they are going into the hedge because the first shoots are growing in the most protected places and it is directly related to the time of year. The tastiest food is under the hedge. Colin, I am concerned by the problem with your hedges.There were a lot of hedges destroyed in Australia but recently their value as windbreaks was recognised and they are now being maintained. 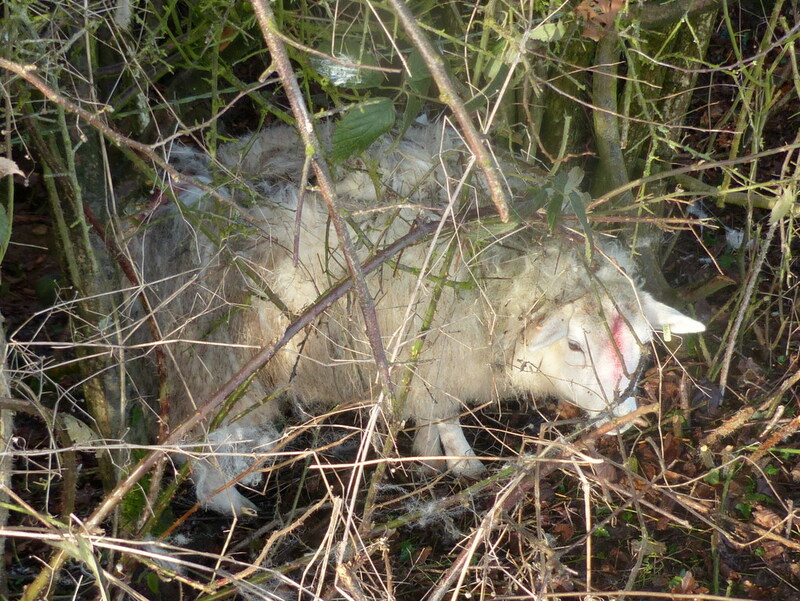 I know that in England they are protected but your sheep should not be getting tangled in them. 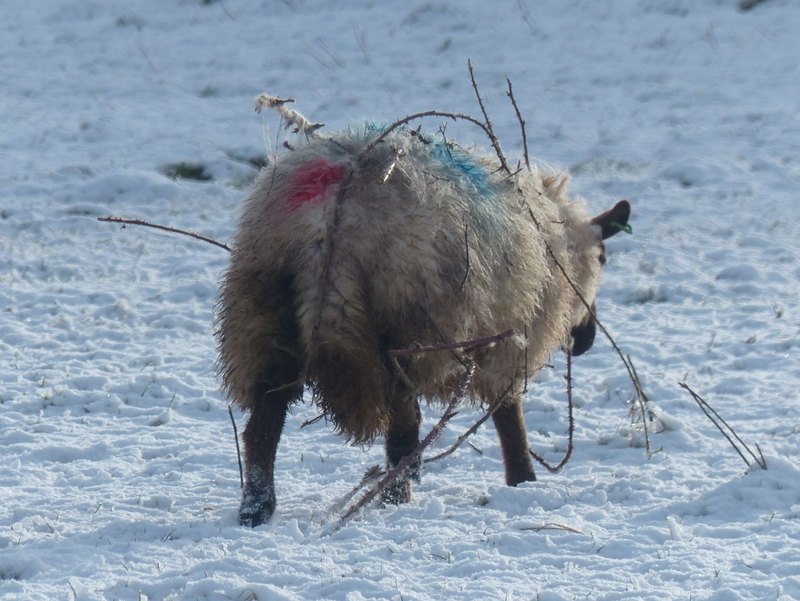 Please forgive me if I sound like I am butting in but the hedges with brambles could easily be separated from the sheep with a single strand of electric fencing. Where the hedge is particularly important as an environment for birds and other native animals trimming should only happen every third year and in rotation so that all hedges are not trimmed at the same time. But a bramble hedge should be trimmed a little more often. This is from a farmer’s perspective and not from a naturalists’. A naturalist would prefer to have the sheep out of there. That is why the electric fence seems to be a compromise. Anyway, enough unsolicited advice from a half a world away. As it should be. An electric fence will work on sheep if it is set up correctly , but it won’t work if it set for cows. It must be at a level were they will touch it with the nose. Thank you for sharing that Joy 🙂 It sounds like you had some pretty irresponsible neighbours there, for a while. When our sheep are in the orchard, it adjoins the back garden, they like to stick their heads through the fence and eat the flowers in the garden but nobody seems to mind. Thank you John 🙂 I don’t know anything about sheep, it is only since I moved here about a year ago that I have even seen them close up. My landlord is a retired dairy farmer who keeps a few sheep just to keep the grass down in the small paddocks behind the farm. There are four large fields that have been let out to a local farmer for the last decade. He will either put sheep or cattle on them or he lets them grow and harvests them for silage or hay. These people are farmers and they have been keeping animals on these fields for a long time without my help so I am at a loss to understand why every time that I go out I find sheep stuck in the hedge. I am told that once a sheep gets stuck they will just accept their fate and stay there until they die and when I find them they always seem quiet and accepting. These seem to me to be killing fields and the last place that you should put sheep. When I came here I was amazed at how easy it was to keep sheep. They didn’t seem to need any looking after at all, just give them a field and they will take care of themselves. I probably missed most of what was going on. The Landlord’s son has two dogs and he walks the fields every morning. 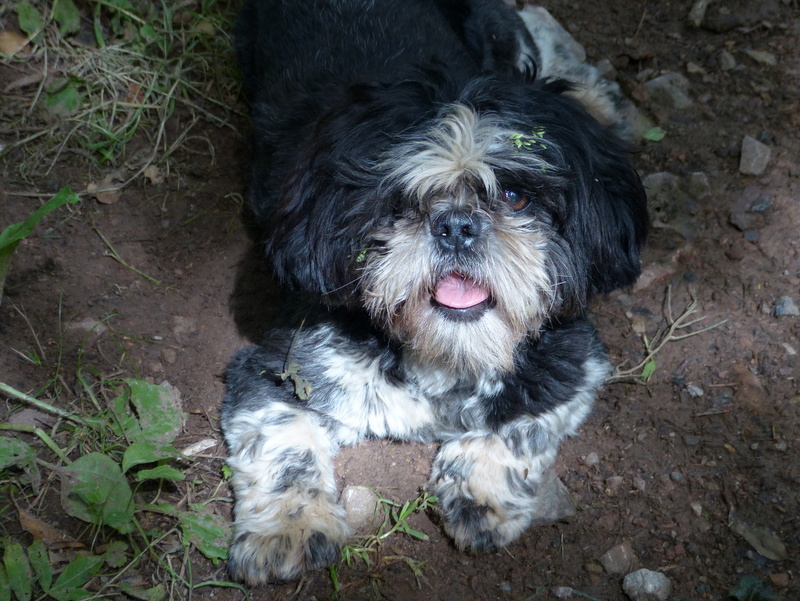 My walks with Fizz are probably just providing a little extra care and any animal that we find would have been picked up the next morning anyway. The problem seems to be related to the time of year. New shoots are appearing under the hedgerow first and the sheep are going in to eat them, it won’t be long before new shoots are coming up everywhere. Also I am told that these sheep are young and it will take them a while to learn not to get stuck and that their wool is too long. They were bought late in the year and maybe it was too late then to shear them. The farmer who rents these fields uses electric fencing effectively. Fences appear and disappear from time to time. I think that he uses them to control which of the four fields he wants the sheep in. There is more to sheep farming than meets the eye. Cows are easy to look after. I wouldn’t have sheep at all but some people love ’em. But the hedgerow is a little unkempt. 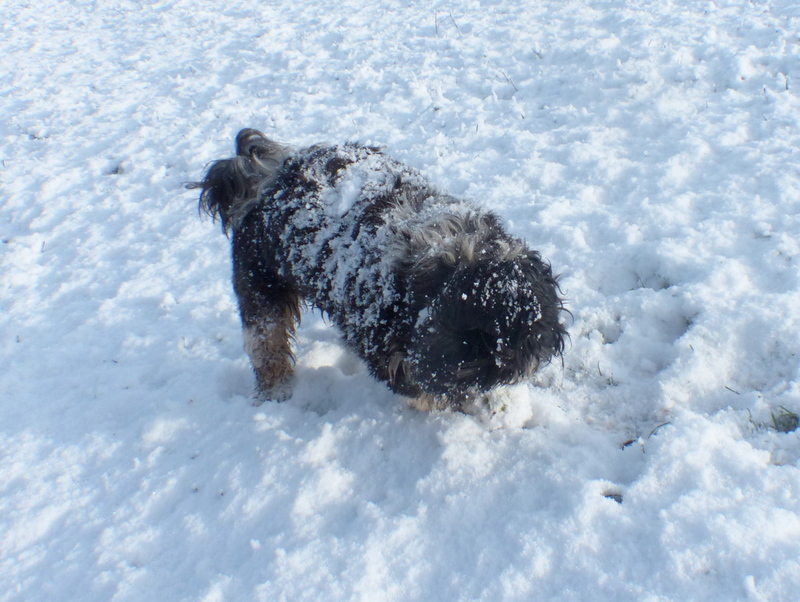 My husband is working in Gloucestershire this week and he told me about the snow last night. None here still! More adventures with the fox and the silly sheep – hooray! 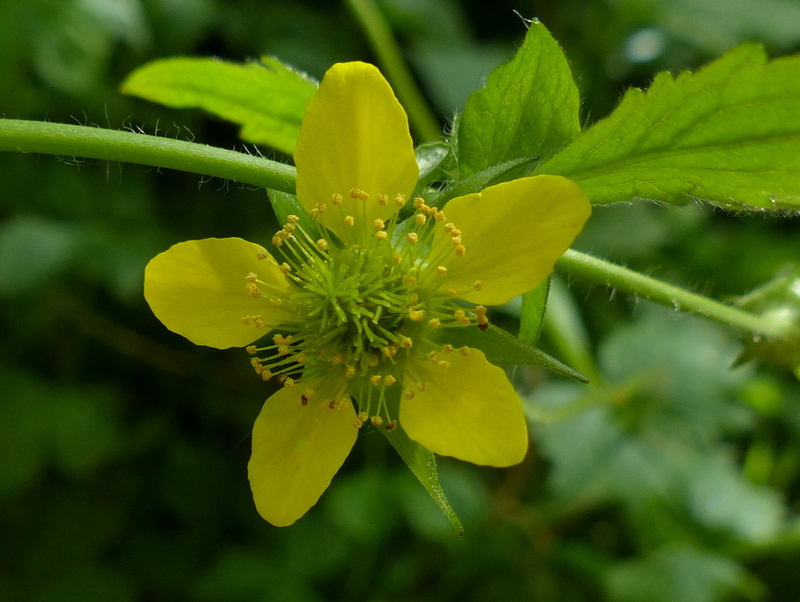 I love everything about Herb Bennet – its lovely yellow flowers and those beautifully shaped leaves. Thank you Clare 🙂 The snow didn’t last for more than a few hours. We have wind and rain back now and the fields are green again. That was probably as close as we are going to get to a real winter. It was a long one and lasted for hours. It is the middle of January and I am still not wearing gloves on my walks, it is quite warm out. On the plus side my fuel bills are very low. Oh my…I don’t know anything about sheep…but ouch…. Thank you Michelle 🙂 It is a prickly problem. You did make me laugh! I really can relate to your issues with sheep. My language may not have been very lady-like at times when I lived on the farm! Yes, you are so cruel throwing snowballs at Fizz. 😉 I do hope you manage to have some happier days soon. I enjoy your sense of humour during your frustrations! May your dreams continue to be about wildflowers..
Those summer flowers and plants made me feel very cold and wintery! Still only four, possibly five months until summer! Thank you John 🙂 Never mind summer, spring is right under our feet and to be there at the beginning with everything stretched out before us is the best of times. Those poor, dumb sheep. It’s a good thing they have you and Fizz to look after them! Happy Trails! Thank you Sandi 🙂 The Sheep are in safe hands. Being former sheperds, we know that sheep need either a board fence or a closely woven wire fence. Even at that, they will still poke their heads through the wire and get stuck. On many occasions, we would have to go and pull the sheep out of the fence. They don’t know enough to ‘back out’. Electric fencing is useless, even if it is at snout level, they can lower their noses, and go right under. The only way that farmer will be able to keep the sheep out of the bramble is to fence it off from them, but it seems to me that he doesn’t find it an issue. Thank you Joy 🙂 I think that the Sheep are only going into the hedge for food, because it is slightly warmer there and that is where the first shoots are coming up. Hopefully it will stop being an issue in a couple of weeks. I’ve never lived with sheep; only cows. I wasn’t the farmer, but I watched the cows since I lived on the farm. They didn’t seem to get into as much trouble as sheep. A friend of ours who had sheep had a wood fence. Beautiful photos of the flowers. Well that was a pretty action packed post. I read it before I went to bed, right after I read another unrelated post about someone finding a loo in the bush. I had a dream that I was driving around all night in a van, looking for a loo. I really needed a loo, but I was in Transit. Well I spotted something white and pulled over onto the side of the road and walked into the trees where I saw it. There it was, the loo, in the bush, covered in brambles. Which just goes to show that you can lead a goat to water but brambles don’t make her Go Peep. Anyway I woke suddenly to the urgent sunshine and looking out saw a spectacular hoarfrost. I took a few photos of our street covered in frost before it melted and as I turned to go back inside, there it was on the corner of my drive, a great big patch of yellow snow. Those BBC weather forecasters are genius! Thank you Stephanie 🙂 We can learn a lot from our dreams. Do you think the Sheep go in the bushes because they are shy? I hadn’t thought of that. Hmm, that’s a good observation. I don’t know enough about sheep to understand their behaviour, but foraging seems also a good guess. I am curious if you have repeated offenders? If so then there is something very compelling for them to risk the unpleasant repeat result, or they just don’t learn from their mistakes.Perhaps we can learn from our dreams, even though they are often nonsense. I am beginning to understand why wool yarn is so expensive. Sheep seem to be high-maintenance critters.